Pairing industrial with fashion design is not a new thing. Particularly when it comes to cars, cross-pollination of brand images tends to be a win-win thing. Perry Ellis and Tommy Hilfiger, to name just two fashion entities, have had their imprimaturs stamped on American motor vehicles in the past. But when you’re talking Italian, whether it’s cars or clothing, the level of style, and consequently status, rises considerably. 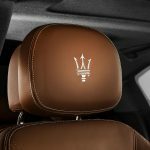 When you hear the hallowed names Maserati and Zegna brought together in one breath, as they were at this February’s Canadian International Auto Show in Toronto, you simply have to take a look. 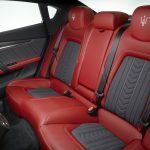 The car-maker debuted its interior package partnership with the fashion house for the 2016 model year. 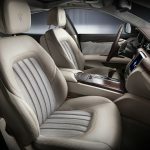 At present, Zegna Edition interiors are available just in the sport sedan models Ghibli and Quattroporte; later on, they are slated to roll out across the complete Maserati product line. The exclusive, custom-option interiors come in three colour groupings. All feature ornamental headrest stitching and meld fine-grain leather trim with 100 per cent natural Mulberry silk inserts on the seats, door panels, roof lining, sunshades and ceiling light fixture. A deceptively strong fibre with a sensuous hand, silk has for centuries denoted the highest luxury; Mulberry silk, originally from China, is considered the best of the best. Indeed, it was partly to find this fabled fabric that spurred Marco Polo to start his trek eastward in the late 13th century. It is certainly a fabric that Ermenegildo Zegna, renowned for sourcing top-quality materials, would have used often during his lifetime. After his death in 1966, Zegna’s name lived on in the family-run menswear collection that, like Maserati, is exported around the world. The car company itself was family owned by brothers Alfieri, Bindo, Carlo, Ettore and Ernesto Maserati for decades, beginning in 1914 (it now belongs to the Italian-American giant, Fiat Chrysler). From the first, the brand specialized in fast, elegant cars equally at home on the racetrack and the road. Italian design meets Italian design, representing the ultimate in chic, timelessly sleek. The blend of these two, oh-so-stylish brands assuredly speaks to the better part of our transportation aspirations.